Mario, Master Chief, Chun-Li, Bernie. Oh, you didn’t know? Avuncular Presidential wannabe Bernie Sanders is a video game star. And, thanks to the magic of the internet, you (yes, you!) 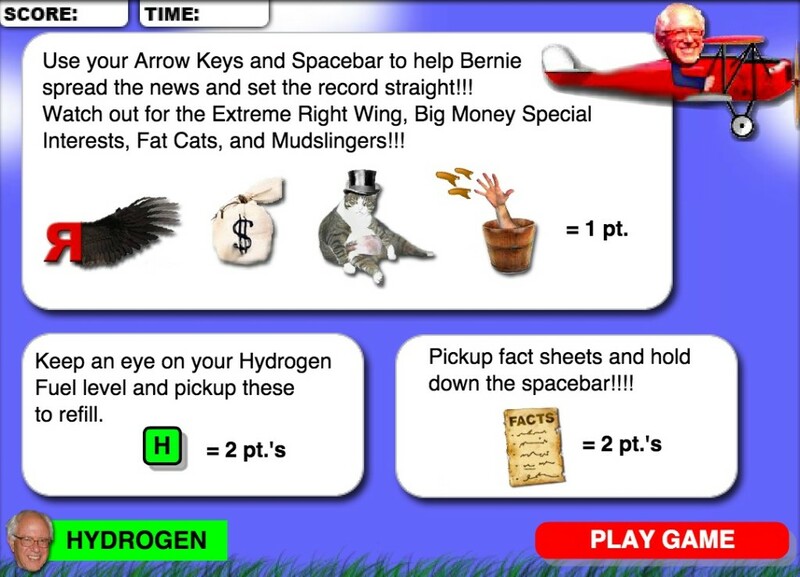 can try your hand at “Bernie Arcade,” created for his 2006 Vermont senatorial re-election run. The goal is simple: Bernie flies a single-pilot prop plane, dodging money, felines, and the letter “R” in order to stock up on green energy, and shoot his enemies with hand-scribbled fact sheets. Sanders himself provides the game’s narration, declaring “that’s unfortunate” each time you pilot his plane into a mud-slinging enemy, or toward a big bag of special-interest cash. Still, for Bernie fanatics who insist on Sandersizing every facet of their waking life, you’re welcome.